1) (Cumberland). Or, an eagle displ. purp. membered gu. 2) (co. Huntingdon). Vair an orle ar. on a bordure gu. eight crosses crosslet or. 3) (London, and Bucksted, co. Sussex; confirmed 20 June, 1608). Or, an eagle displ. sa. armed and membered az. a chief vair. 4) (co. Warwick). Gu. three eagles displ. or, membered az. 5) Ar. on a chief sa. three griffins’ heads erased of the field. 6) Or, an eagle displ. sa. charged on the breast with ten plates in cross. 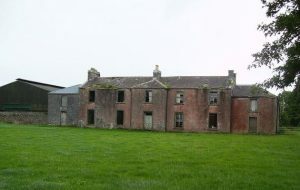 7) (Hollymount House, co. Mayo). Gu. a fesse chequy ar. and az. betw. three mullets of the second. Crest—An eagle displ. with two necks. 8) (Scotland; earliest arms). Gu. an eagle displ. or. 9) (Earl of Crawford, and Balearres). Quarterly,1st and 4th, gu. a fesse chequy ar. and az., for Lindsay; 2nd and 3rd, or, a lion ramp. gu. debruised of a ribbon in bend sa., for Abernethy. Crest—An ostrich ppr. holding in his mouth a key or. Supporters—Two lions sejant guard, gu. Motto—Endure fort. 10) (Lord Spynie; title extinct or dormant; heir of line H. A. Lindsay-Carnegie, of Spynie, paternally a Fullerton). Quarterly, 1st and 4th, gu. a fess chequy ar. and az. with a label of three points ar. in chief; 2nd and 3rd, Abernethy, as above. Crest—An ostrich’s head erased ppr. with a label of three points ar. above the neck, holding in the beak a horseshoe or. Supporters—Two lions sejant guard, gu. armed or, with a label of three points above the neck or. Motto—Toujours loyal. 11) (Edzell, co. Forfar). Quarterly, as Earl of Crawford, within a bordure ar. 12) (Earl of Balcarres; the sixth Earl of Balcarres became, de jure, Earl of Crawford, and the right of the seventh earl to that title was recognised by the House of Lords). Quarterly, as Earl of Crawford, within a bordure az. charged with fourteen stars or. Crest—A tent az. fringed and semée of stars or, ensigned with a pennon gu. Supporters—Two lions sejant guard, gu. each with a collar az. charged with three stars or. Motto—Astra castra nunien lumen munimen. 13) (Deerpark, co. Devon, 1871). Quarterly, 1st, 2nd, and 4th, as in the arms of the Earl of Crawford; 3rd, counterquartered, 1st and 4th, gu. a bend betw. six cross crosslets fitchée ar., for Howard; 2nd and 3rd, ar. a lion ramp. gu., for Forward. Crest and Motto, as Earl of Crawford. 14) (Sir Coutts Lindsay, of Balcarres and Westville, s. in 1837 to baronetcy conferred on his maternal grandfather, Sir Coutts Trotter, in 1821). Quarterly, 1st and 4th, the quartered coat of the Earl of Balcarres; 2nd and 3rd, counterquartered, 1st and 4th, ar. a crescent gu. on a chief indented az. three mullets pierced of the field, for Trotter, 2nd and 3rd, gu. a lion ramp. ar. crowned or, with a crescent of the first on the lion’s shoulder, for Mowbray; these two coats within a bordure erm. Crest—As Earl of Balcarres. Supporters—Dexter, a white horse ppr. ; sinister, a lion ar. armed and langued az. Motto—Astra castra numen lumen munimen. 15) (Balgawies, co. Forfar). Quarterly, as Earl of Crawford, within a bordure ar. a crescent or, in the centre for diff. 16) (Evelick, co. Perth, bart., 1666). Quarterly, as Earl of Crawford, within a bordure az. Crest—a sword erect, on the point a pair of balances all ppr. Motto—Recta vel ardua. 17) (Kilspindie, co. Perth). As the last, charging the bordure with eight roses ar. for diff. Same Crest and Motto. 18) (Pitcarlies and Cairn, co. Forfar). Quarterly, 1st and 4th, gu. a fess chequy ar. and az. within a bordure counter-compony of the second and third; 2nd and 3rd, or, a lion ramp. gu. debruised of a ribbon in bend sa., for Abernethy. Crest—Two stalks of wheat bladed and eared, disposed in saltire ppr. Motto—Non solum armis. 19) (Dowhill, co. Kinross). Gu. a fess. chequy ar. and az. in dexter chief a mullet of the second, the base barry wavy of the second and third. Crest—A castle ppr. Motto—Firmus maneo. 20) (Culsh, co. Aberdeen; now represented by Dingwell-Fordyce, of Bruckley, as heir of line). As the last, within a bordure engr. or. Crest—A tower ppr. ensigned on the top with a crescent ar. Motto—Firmiter maneo. 21) (Cavill, co. Kinross). Quarterly, as Earl of Crawford, within a bordure quarterly or and gu. charged with eight martlets counterchanged. Crest—An ostrich head erased ppr. Motto—Sis fortis. 22) (Lord Lindsay, of the Byres; title dormant since 1808, now claimed by Sir J. T. Lindesay-Bethdne, Bart., of Kilconquhar). Gu. a fess chequy ar. and az. in chief three mullets of the second. Crest—A griffin’s head ar. beaked gu. Supporters—Two griffins gu. armed and membered or. Motto—Je ayme. 23) (Viscount Garnock). Quarterly 1st and 4th, az. three crosses pattee or, for Barclay; 2nd and 3rd, gu. a fess chequy ar. and az., for Lindsay; ensurtout, gu. a fess erm., for Crawford. Crest—A stag’s head erased ppr. betw. the attires a cross pattee fitchee gu. Supporters—Dexter, a Highlander ppr. with a shield gu. in his exterior hand, charged with a fess erm. ; sinister, a greyhound ppr. collared erm. Motto—Hinc honor et salus. 24) (Kirkforther, co. Fife). Gu. a fess chequy ar. and az. betw. three mullets in chief and a hunting horn in base of the second. 25) (Pyetstone, co. Fife; the branch to which the historian Lindsay, of Pitscottie, belonged). Gu. a fess chequy ar. and az. betw. three mullets in chief and a mascle In base of the second. 26) (Wormistone, co. Fife). Gu. a fess chequy ar. and az. betw. three mullets in chief of the second and an annulet in base or. Crest—An ostrich ppr. Motto—Patientia vincit. 27) (The Mount, co. Fife; as borne by Sir David, Lyon King of Arms). Gu. a fess chequy ar. and az. betw. three mullets in chief and a man’s heart in base of the second. Crest—A man’s heart in flames gu. Motto—Je ayme. 28) (Covington, co. Lanark). Gu. a fess chequy ar. and az. in base a mascle or. 29) (Wauchopedale, co. Dumfries). Gu. a fess chequy ar. and az. in chief a label of three points of the second. 30) (Dunrod, co. Renfrew, representative of Craigie, co. Ayr). Gq. a fess chequy ar. and az. betw. three stars of the second. Crest—A duck with wings expanded ppr. Supporters—Two unicorns sejant. 31) (Blacksolme, co. Renfrew). Gu. a fess chequy ar. and az. in chief a label of three points of the second. Crest—a withered branch of oak sprouting forth green leaves ppr. Motto—Et mortua virescunt. 32) (Linbank, co. Lanark). Gu. a fess chequy ar. and az. betw. two mullets in chief and a hunting horn in base of the second. 33) (Corsbasket, co. Lanark). Gu. a fess chequy ar. and az. betw. two mullets in chief and a cinquefoil in base of the second. 34) (Turin Castle, co. Mayo). As Dunrod. Crest—A two-headed eagle gu. Motto—Endure fort. 35) (Bonhill, co. Dumbarton). Quarterly, as Earl of Crawford, in the centre of the quarters a rose gu. 36) (Broadlands, co. Kincardine). Gu. a fess chequy ar. and az. in chief a fleur-de-lis of the second. 37) (Pitscandlie, co. Forfar). Gu. a fess chequy ar. and az. betw. a mullet of the second in chief and a dirk paleways ppr. in base. 38) (co. Huntingdon). Gu. an inescutcheon vair bordured az. within an orle of eight crosses crosslet or. 39) (co. Kent). Or, an eagle displ. sa. on the breast a mullet of the first a bordure gu. charged with eight cinquefoils ar. 40) (co. Lancaster). Gu. an orle ar. 41) (London, and Bucksted, co. Sussex). Or, an eagle displ. sa. anned az. a chief vair. Crest—An eagle displ. sa. beaked and legged or, charged on the breast with a cross pattee of the last. 42) (Colby, co. Norfolk). Or, an eagle displ. gu. Crest—A unicorn sejant reguard. or, armed, hoofed, maned, and ducally gorged ar. 43) (Gunton, co. Norfolk). Same Arms, a bordure of the last charged with ten cinquefoils ar. 44) (co. Northumberland). Or, an eagle displ. vert. 45) or Lymesey – (co. Warwick). Gu. an eagle displ. or. 46) Or, an eagle displ. sa. on the breast nine plates in cross. 47) Ar. a lion ramp. gu. betw. three trefoils vert. 48) or Lyndesey – Per fesse sa. and ar. a bear ramp. counterchanged, muzzled gu. Crest—A demi bear ramp. sa. 49) Gu. an orle vair betw. twelve crosses crosslet or. 50) (the Mount, co. Fife; Sir David Lyndsay, Lord Lion King at Arms, created by James V. 1530). Gu. a fesse chequy ar. and az. betw. three stars (or mullets) in chief and a man’s heart in base ar. Crest—Amidst flames a heart transfixed by a dart all ppr. Supporters—Faith and Hope. This is a locational surname denoting a person who was “of Lindsey”, a parish in county Suffolk, England, meaning linden-isle, along with other locales. The name derives from the Old English toponym Lindesege “Lindum Isle” or “marshland of Lincoln”. The Kingdom of Lindsey or Linnuis was a smaller Anglo-Saxon kingdom that was absorbed into Northumbria in the 600s AD. Lindum Colonia was the Roman name for the settlement which is now the city of Lincoln in Lincolnshire. A one Ealdric de Lindsay held lands in both Normandy and Lincolnshire and he was a tenant of English estates for the Earl of Chester. 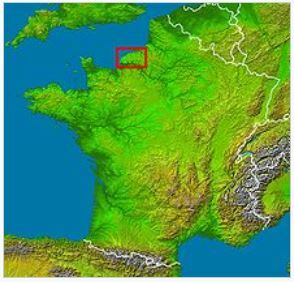 The name is primarily Scottish, but one source asserts it is actually Norman, deriving from De Dimesay, Pays de Caux, Rouen, France, in northern France on the River Seine. Some members of Clan MacClintoch changed their name to Lindsey for reasons not quite known to history. The name was later found in England. The spelling variations of the name are numerous, and one from Lindsay in Lincolnshire, England was first found in the form Lindissi, likely deriving from the British name of Lincolnshire. In Ireland, it can be a reduced and Anglicized form of several Gaelic surname, including Ó’Loingsigh. The family of Lindsay originated in the parish of Lindsay, in the northern English county of Northumberland. The surname was first found in a land called Lanarkshire, which is a former county of the Strathclyde region of Scotland. This region is now divided into the Councils of North Lanarkshire, South Lanarkshire, and the city of Glasgow. The Lindsay name and family were descended from Randolph Lord of Toeni, who was a banished by Duke William from Normandy in 1058 when they invaded England. Randolph then settled on the borders of Lincolnshire and Leicestershire and created a division called Linesi which included Belvoir Castle. When the Duke of Normandy invaded again, they were forced to move to Crawford in Lanarkshire, Scotland. King David of Scotland then gave his official confirmation to the Lindsay Clan in 1124. Crawford continued to have extensive Earls of lineage of the Lindsay name. The name of Lindsey actually has older ties and an origin to the Roman city of Lindum Colonia. This was a tribal territory of the Crieltavi. The city existed in the midst of a post Roman empire, in the 5th century. Evidence of this region is extremely vague, so it may have remained under Britain’s central administrative control, but not for long. The Lindsey name continued its development by a group of Angles, that founded the kingdom in 480 AD. They called themselves Lindisware, which became Lindissi over time. These Angles intermingled with the Germanic and native population there, and originally took the local name of “folk of Lindum.” After Lindissi, it became Lindsey. This kingdom had no recorded history, even before the Roman conquest, but the name of its fourth king suggest links to the Britons living there. The city was named Lincoln over time and appeared after the period of prosperity in Roman Britain in the 360’s. Since the city fell, much of the people moved to the countryside. This area became Lincolnshire after these events over time, with Lindsey becoming a parish within. This was the start of the Anglo Saxon Kingdom of Lindsey. Also, the name is claimed to be of Norman origin, from De Limesay, Pays de Caux near Pavilly, north of Rouen. There are several theories to where the name originated and evolved to be. The name of Lindsey carried on to be borne by the Earls of Balcarres and Earls of Crawford, which continued up to the present day, Robert Lindsay, who is the 29th Earl of Crawford. Common spelling variants or names with similar etymologies include Lindsay, Lyndsay, Lyndsey, Lindesey, and Lindesay. Less common spelling variants and similarly spelling names include Lindisi, Lyndisay, Linsey, Lincey, Lindseye, Llindsey, Lindssey, Lindsaey, Linndsey, Lindsoey, Liendsey, Lindseey. Lyndzy, Lndsy, Lyndzy, and Lyndzy. The last name Lindsey ranks 495th in popularity in the United Status as of the 2000 Census. The name ranks particularly high in the following five states: Mississippi, Alabama, Arkansas, Hawaii, and Kentucky. The surname spelling variant Lindsay ranks 1,008th in commonness/popularity in the same census. The surname Isaac frequency/commonness ranks as follows in the British Isles: England (3,057th), Scotland (4,429th), Wales (3,094th), Ireland (19,046th) and Northern Ireland (3,642nd). In England, it ranks highest in Cambridgeshire. In Scotland, the surname Lindsey rankest highest in Dumfriesshire. In Wales, it ranks highest in county Pembrokeshire. In Ireland, it ranks highest in Cavan. In Northern Ireland, it ranks highest in Londonderry. The name is also present throughout the remainder English speaking world: Canada (6,195th), New Zealand (3,848th), Australia (5,301st), and South Africa (25,955th). The 1890 book Homes of Family Names by H.B. 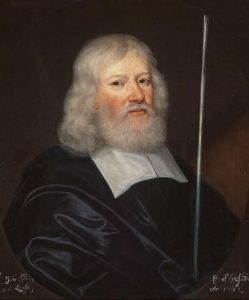 Guppy, states the following in regard to the surname Lindsay: “The ancient and distinguished Scottish family of Lindsay who boasted of 20 Earls of Crawford was probably in the first place of English origin. A Lincolnshire division and a Suffolk parish bear the name”. In Scotland, Sir Walter de Lindeseya was recorded as a witness in the Inquisitio of Earl David around 1124 AD. His great-grandson, Sir William de Lindesei, was one of the hostages for King William the Lion, around 1174 AD. A one Walter de Lyndesay was documented in 1271 AD. William de Lyndesai was documented in 1273 AD. The Hundred Rolls of 1273 AD, a census of Wales and England, known in Latin as Rotuli Hundredorum lists three bearers of this surname: Thomas de Lyndesey (Derby), Henry de Lindeseye (Kent), Robert de and Lindesay (Nottinghamshire).The Poll Tax of Yorkshire in 1379 AD lists two bearers of this last name: Willemus de Lyndesay and Jacobus de Lyndesay.Early marriages involving this surname include 1) Elizabeth Lynseye to Ralph Brooke in 1546 and 2) Margaret Lindsey to William Ball at St. George’s Hanover Square in 1793. Thomas Spencer Lindsey, Esquire of Hollymount House in county Mayo was a Justice of the Peace and Deputy Lieutenant, as well as a Major in the South Mayo Rifles, who was born in 1828. 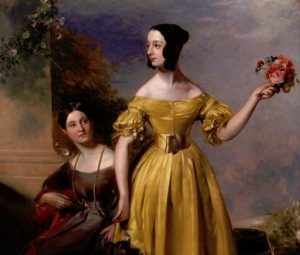 In 1864, he married Mary Catherine Caroline, daughter of George Hayward Lindsay, and had a daughter with her named Mary Georgiana Cecelia Katherine. The lineage traces back to Thomas Lindsey, Esq., son of Thomas of Turin Castle, a descendant of the great Scottish House of Lindsay. In 1757, he married Frances Muschamp Vesey, grand daughter of Dr. John Vesey, and had a son with her named Thomas. 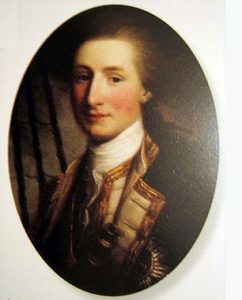 This Thomas Lindsey was an Esquire of Hollymount and in 1784, he married Lady Margaret Eleanor Bingham, daughter of Charles, 1st Early of Lucan, and had eight children with her: Thomas Spencer, Charles Richard (Royal Navy), William Henry Bingham (Lieutenant 10th Hussars at Waterloo), Margaret Louisa (married Reverend J.P. Porter), Anne (married Hon. and Rev. J.G. 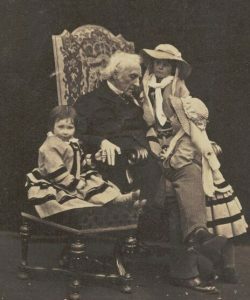 Browne), Eleanor (married James Reed), Emily (married Reverend Edmund Dowdney), and Louisa. The eldest son was Thomas Spencer Lindsey, Esquire of Hollymount who was Justice of the Peace, Deputy Lieutenant, and High Sheriff, born in 1790. 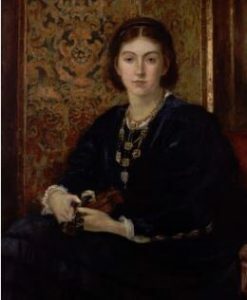 In 1818, he married Margaret Hester, daughter of Richard Alexander Oswald, and had the following issue with her: Richard Alexander, Thomas Spencer, Lucy (married George Ramsay Campbell), Anne Eleanor Matilda Nina (married Baron Godefroy de Blonay of Vernaud of Switzerland), Hester Elizabeth Frances (married Francis Ruttledge), Lillias Margaret Jane, and Katharine Mary. The Lindsey Coat of Arms (erroneously called the Lindsey Family Crest) is blazoned in heraldry as follows: Gules, a fess chequy argent and azure, between three mullets of the second. Crest: An eagle displayed with two necks. George Augustus Frederick Albemarle Bertie, Earl of Lindsey, county Lincoln, was born in 1814 and succeeded his father as the 10th Earl upon the death of his father in 1818. This noble family eventually obtained the highest rank in the British peerage, descended maternall from the Willoughbys, the original Batons of Willoughby de Eresby, and paternally from the Berties of Bersted in Kent. The Berties were a very ancient house, deriving descent from a family of free Barons of Bertieland in Prussia. They first member of their family that landed in England came with the Saxons, and their descendant, Leopold Bertie, was the constable of Dover Castle during the reign of King Ethelred, and was also the proprietor of a castle and town named Bertiested, now Berset, near Maidstone, in Kent. This title was created in the Peerage of England in 1626 for the 14th Baron Willoughby de Eresby. The coat of arms is as follows: Argent, three battering rams, barwise in pale proper, armed and garnished azure. The title is currently held by Richard Henry Rupert Bertie, the 14th Earl of Lindsay and 9th Earl of Abingdon who was born in 1931. The Earldom of Lindsey, a title in the Peerage of Scotland, was created in 1633 for John Lindsay, 10th Lord Lindsay, who later inherited the ancient Earldom of Crawford. The subsidiary titles of the Earl are: Viscount of Garnock (created 1703), Lord Lindsay of The Byres (1445), Lord Parbroath (1633) and Lord Kilbirnie, Kingsburn and Drumry (1703). The family is seated in Lahill House, near Upper Largo, Fife. Baron Lindsay of Birker, Alexander Dunlop Lindsay, of Low Ground, county Cumberland, England was born in 1879. He was a Major-General who served in World War I and was educated at Glasgow Academy and University and the University of Oxford. In 1907, he married Erica, daughter of F. Storr, and had three issue with her: Michael Francis Morris (served with the army in North China, married Hsiao Li, daughter of Colonel Li Wen-Chi), Thomas Martin (Major of the Sherwood rangers who served in World War II, married Denise Theresa, daughter of Gerald Albert Vaughan), and Anna Drusilla (married Ian Dixon Scott). He was the son of Reverend T.M. Lindsay and was created Baron of Lindsay in 1945. The family resided at The Master’s Lodgings, Balliol College, Oxford, and Lowe Ground, Boot, Cumberland. The name of Lindsey carried on to be borne by the Earls of Balcarres and Earls of Crawford, which continued up to the present day, Robert Lindsay, who is the 29th Earl of Crawford. Sir William Lindsay, of the Byres, who is the son of Sir David Lord of Crawford, obtained the Barony by charter in January 17th, 1365. This was due to the resignation of his brother, named Sir Alexander of Glenesk. Sir William was a famous knight who gained the respect of the kingdom. David Lindsay, who was a Scottish peer was given the title of 1st Earl of Crawford. He was the son of Sir Alexander Lindsay of Glenesk and Katherine Stirling. He was known as Sir David Lindsay of Glenesk. He was known as a jousting champion who defeated the English champion Lord Welles on St. George’s Day in 1390. 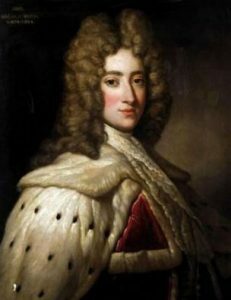 He married Elizabeth Stewart, daughter of King Robert II and had four children, by the names of Alexander Lindsay, Gerard Lindsay, David Lindsay, and Elizabeth Lindsay. Alexander Lindsay, the 2nd Earl of Crawford was also a Scottish peer. He was knighted on May 21st, 1424 by King James I. He then married Marjorie, and had three children, named David Lindsay, Elizabeth Lindsay, and Christian Lindsay. David Lindsay, the 3rd Earl of Crawford was a regent to James II of Scotland. He fought in the Battle of Arbroath in 1445, against the Clan of Ogilvy. He died on January 17th, 1446 in this war, because he rode between the two armies to do his diplomatic duty, and call a truce. They misinterpreted this peace offering, and thought it was an attack, resulting in the throwing of a spear into the Earl’s mouth. This killed him on the spot and the battle then continued on in Lindsay’s favor. Marjorie’s last name was Ogilvie, who he married and had 7 children: Alexander Lindsay, Walter of Beaufort and Edzell, William Lindsay of Lekoquhy, Sir John Lindsay, James, Janet Lindsay, and Elizabeth Lindsay. Alexander went on to carry the Earl of Crawford. Alexander Lindsay, 4th Earl of Crawford was a Scottish nobleman, and a magnate of the northeast of the country. He was known as the “Tiger Earl” or “Earl Beardie, and was one of the most powerful of the Scottish nobles. He was at war with King James II as part of the Douglas rebellion that had started in 1452. In February of that year, William Douglas, 8th Earl of Douglas, was killed at Stirling Castle by James II. He had died because he refused to dissolve his league with Alexander. The Tiger Earl was defeated at the Battle of Brechin in May, and he submitted in 1452. He also had children named Lady Elizabeth Lindsay, David Lindsay, 1st Duke of Montrose, and Alexander, 7th Earl of Crawford. David Lindsay, the 5th Earl of Crawford, and 1st Duke of Montrose took to the throne with his father’s death in 153. 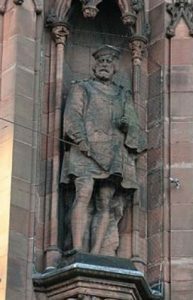 He was a politician who held the titles of Lord Admiral of Scotland, Master of the Royal Household, Great Chamberlain, and Justiciar. In 1488, he was given the name of Duke of Montrose, who he was the first Scotsman not of royal blood to be granted as a Dukedom. He remained loyal to the king of James III during the rebellion of his son Prince James. On 1495 at his death, he had three children to carry on the name. They are Alexander Lindsay, Elizabeth Lindsay, and John Lindsay. 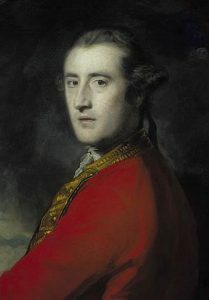 John Lindsay, 6th Earl of Crawford, was accused of murdering his brother, Alexander. He appeared in court and was declared a rebel, but eventually died at the Battle of Flodden, between the Kingdom of England and the Kingdom of Scotland. Alexander Lindsay, 7th Earl of Crawford, does not have much information on him, since he was murdered. He however, had a son, named David Lindsay, who would become the 8th Earl of Crawford. He then had a son named Alexander Lindsay, who became the 9th Earl of Crawford. A distant cousin named David Lindsay of Edzell so the choice was the 8ths. King James V taxed this transaction of 100,000 Merks. David Lindsay, 10th Earl of Crawford does not have much history either. His son, however, was also named David, and was the 11th Earl of Crawford. David was known as extremely rebellious, and had uncertain religious views. In March 1557, he entered a battle that resulted in the death of Lord Chancellor Glamis, his enemy. He was shot dead, and the blame was on David. He was a prisoner and sent to Edinburgh Castle. His son, David as well, was a warrior as well. He killed his kinsman in 1605, Walter Lindsay of Balgavie. He began to be under the surveillance of his family and died in Edinburgh Castle in 1621. He was the 12th Earl of Crawford. The next Earls of Crawford went as follows: Henry Lindsay, 13th of Crawford, George Lindsay, 14th Earl of Crawford, Alexander Lindsay, 15th Earl of Crawford, and Ludovic Lindsay 16th Earl of Crawford. The 17th Earl of Crawford was named John Lindsay, and the 18th Earl of Crawford was named William Lindsay. These two had new heir names of the 1st and 2nd Earls of Lindsay. John Lindsay, 19th Earl of Crawford, was a Scottish politician. He was trained as a lawyer and was elected as a representative in Scotland. He was also the 12th Lord Lindsay of Byres. His son, Lieutenant-General John Lindsay, was the 20th Earl of Crawford. He served in the Austrian and Russian armies before returning to Britain. 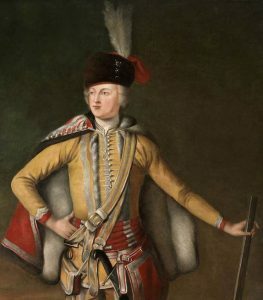 He fought in many battles including the Battle of Dettingen, the Jacobite Uprising and the Battle of Fontenoy in 1745. George Lindsay-Crawford was the 21st Earl of Crawford and the 5th Earl of Lindsay. George Lindsay-Crawford was the 22nd Earl of Crawford, the 6th Earl of Lindsay, and the last male descendant of 1st Earl of Lindsay. It was passed on to a kinsman of 1st Earl of Lindsay to Alexander Lindsay, 23rd Earl of Crawford and 7th Earl of Balcarres. He was a General in the British Army and fought in the Battle of Saratoga. He married his cousin and had five children. James Lindsay, the son of Alexander was the 7th Earl of Balcarres, and the 24th Earl of Crawford. He was also in the army and earned the rank of major. 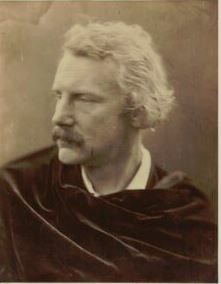 Alexander William Crawford was the 25th Earl of Crawford, and the 8th Earl of Balcarres. James Lindsay, 26th Earl of Crawford, and the 9th Earl of Balcarres was a British politician, astronomer, and a freemason. He also was the president in the Royal Astronomical Society. David Alexander Edward Lindsay, 27th Earl of Crawford and the 10th Earl of Balcarres. David Alexander Robert Lindsay, 28th Earl of Crawford and the 11th Earl of Balcarres Robert Alexander Lindsay, 29th Earl of Crawford and the 12th Earl of Balcarres. Robert Lindsey was recorded as living in Virginia in February of 1623 (“Over the River”). Other early settlers in colonial America bearing this surname include James Lindsey (Maryland 1647), Margaret Lindsey (Maryland 1652), Edmond Lindsey (Maryland 1656), Alice Lindsey (Maryland 1661), Andrew Lindsey (Virginia 1713), Alexander Lindsey (New England 1719), and Donald Lindsey (New York 1739). Charles Bolton’s American Armory (1927) contains one entry for this surname: Quart 1 and 4: Gules a fess chequy argent and azure; 2 and 3: Or a lion ramp gules, the shield debruised of a ribbon in bend sable over all. Crest: a cubit arm in armor in pale holding in the hand a sword erect argent on the point a pair of balances of the last. Motto: Recta sed ardua. Broken tombstone of Rev. David Lindsay of Yeocomico, Northumberland Co., Va. 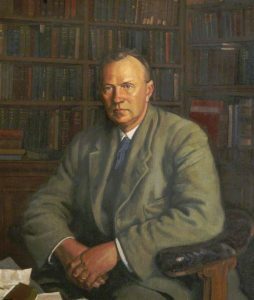 He d. 3 Apr. 1667. Used also by William Lindsay of Boston on automobile. Crozier Va. Heral., p. 43. The same blazon is listed in Crozier’s General Armory (1904). Matthew’s American Armoury (1907) and Bluebook contains one entry for this name: John Douglas Lindsay of New York. He was born in 1865 and became an Assistant District Attorney in New York County in 1894. In 1895, he married Stella, daughter of Dr. Elisha Hall and Jael Kavanagh (Smallwood) Gregory of St. Louis. He was the son of Dr. William F. Lindsay and Sarah Vredenburgh. His ancestor Christopher Lindsay emigrated to America in 1629, settling in Lynn, who was the son of Christopher of Pitscottie, Scotland. John Douglas Lindsay descended from Sir William de Lindsay, of Ercildun, Luffness and Crawword (1161-1200 AD). He bore the following Lindsay Coat of Arms (erroneously called the Lindsay Family Crest) blazoned in heraldry as follows: Gules, a fess chequy argent and azure, three stars in chief and a mascle in base argent. *The crest of this family is a sword erect in pale point upwards on the point a pair of scales. This denotes that your acts should be guided by the balance of justice, even when you are endangered by the point of the sword. There are hundreds of notable people with the Lindsey surname. This page will mention a handful. Famous people with this last name include: 1) John Vliet Lindsay (1921-2000) who served as the 103rd Mayor of New York City from 1966-1973, 2) Sir Lionel Arthur Lindsay (1874-1961) who was an Australian artist born in Creswick, Victoria, 3) Nicholas Vachel Lindsay (1879-1931) who was an American poet born in Springfield, Illinois, considered to be a founder of modern singing poetry, 4) Robert Blake Theodore Lindsay (1925) is a former professional hockey player who played on the Detroit Red Wings and Chicago Black Hawks from 1944-1965 and is considered one of the top 100 NHL players of all time, 5) George Smith Lindsey (1928-2012) who was an American actor born in Fairfield, Alabama who was best known for playing Goober Pyle on The Andy Griffith Show, 6) Adrian Hobart Lindsey (1895-1980) who was an American football player and coach of football and baseball, born in Vienna, Illinois, who coached at Bethany College, the University of Oklahoma, and the University of Kansas, 7) Theophilus Lindsey (1723-1808) who was an English theologian and clergymen who founded the Unitarian congregation in England, 8) Isaac Coleman Lindsey (1892-1968) who was a member of the Louisiana State Senate, a district judge, and the lieutenant governor under Governor Earl Kemp Long, 9) Steven Wayne Lindsey (1960) who is a retired U.S. Air Force officer and NASA astronaut born in Arcadia, California, and 10) Martin Lyndsey or Lindsey who was a English university vice-chancellor in the 1500s. The two main heraldic symbols in the Lindsey Coat of Arms (often mistakenly called the Lindsey Family Crest) are the eagle and the fesse chequy. The main tincture (color) used with these coats of arms is Gules (red). Gules symbolizes or conveys military strength and magnanimity. How would I go about finding which Lindsey I come from? Which coat of arms would be mine? Do you offer this service, for a fee? Matt, The Lindsay International Surname DNA Project has succeeded in sorting about 350 representative Lindsays/Lindseys by their DNA into their respective genetic families. That is the first step to answering your question about which crest pertains to you. I administer this project and will answer any questions you have if you contact me.